HERA Hybrid GRIP Vorderschaft in 15"
Der Schaft kann auch in der Farbe TAN oder OLIV mit 99,-€ Aufpreis beschichtet werden. Das kann separat im Textfeld, in der Bestellmaske, mit angegeben werden und wird von uns dann in die Bestellung mit übernommen! 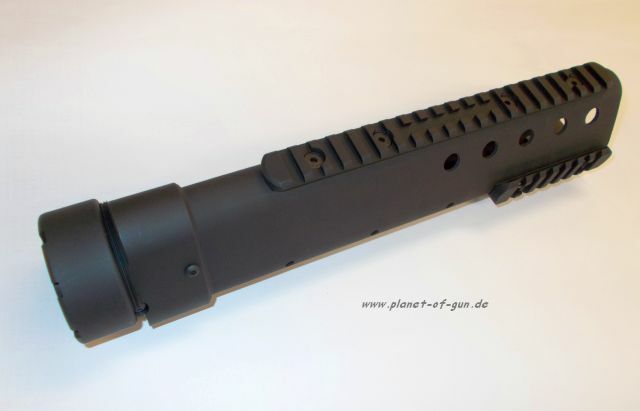 Dieser Schaft passt nur bei AR15 Waffen die KEIN Piston System haben (wie Schmeisser, HERA, DAR, DPMS, Windham, OA)!!! 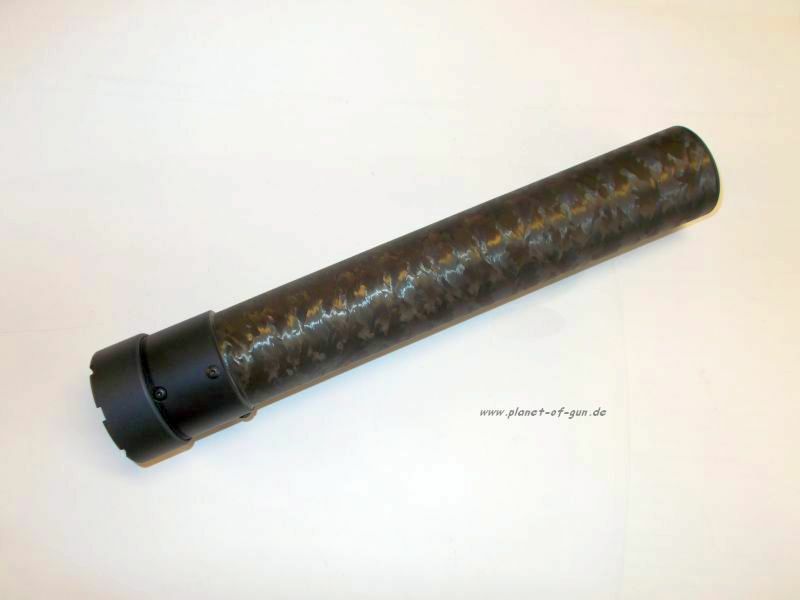 PRECISION REFLEX Delta Gen. III CARBON Handguard für AR15 in "dreieckiger" Form mit 3 Rails in Länge von 12"
The Gen III Delta free-float forend has a triangular cross-section that makes it more comfortable to grasp than many conventional 4-rail handguards, with a flat bottom that’s ideal for shooting from a rest or sandbags. The Delta has the same carbon fiber construction as the standard Gen III to keep the weight down without sacrificing strength. Extra clearance inside, at the top, makes it compatible with most gas piston systems and conversions. An 8½" top rail plus three user-configurable 3½" rails side and bottom rails give plenty of room for mounting a bipod, light, and other accessories. Kit includes the forearm, barrel nut, bolt-on accessory rails, and complete installation instructions. SPECS: Tube – Carbon fiber, black finish. 12½” long, 2-1/8” wide, 2¼” high. Barrel Nut – Aluminum, hardcoat anodized, matte black. AR15/M16 fits standard mil-spec upper receiver. 16 oz. wt. AR-308 fits DPMS LR-308 and clones based on it. 1.2 lbs. wt .Fits older LR-308 Panther “High Profile” uppers for sight regulation. 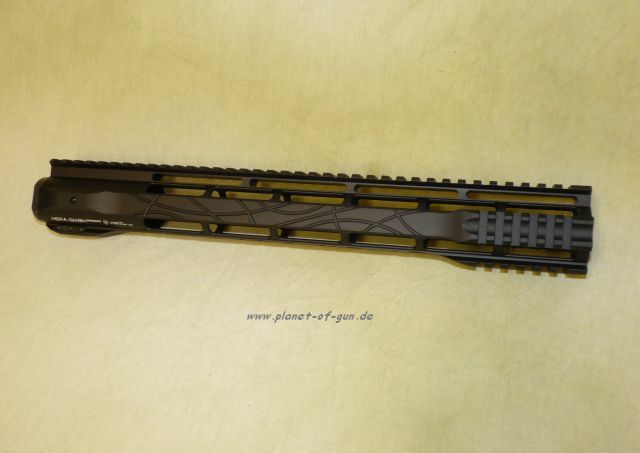 PRECISION REFLEX Forearm Gen. III CARBON Handguard für AR15 in runder Form mit 4 Rails in Länge von 12"
Tubular free-float forearm is made of lightweight, high-strength carbon fiber to reduce heat transfer to the shooter’s hand during sustained fire and provide excellent handling characteristics. Precision-made, aluminum barrel nut rigidly clamps the forearm to the upper receiver. Generous porting on some models enhances heat transfer while reducing weight even more. Ported/Railed with 28 cooling ports, three 3½" Picatinny rails that can be repositioned for specific needs, and an 8½" top rail. SPECS: Tube – Carbon fiber, natural black/silver finish. 2" (5cm) O.D. Barrel nut – Aluminum, hard-anodized, matte black. Lightweight, machined aluminum forearm combines the accessory mounting versatility of a quad-railed forearm with a “smooth,” un-railed area for support hand comfort to aid in enhanced weapon control. Integral, full-length Picatinny top rail, plus forward 2.5" rails on the sides and bottom, offer plenty of attachment space for lights, lasers, optics, backup sights, and other accessories. Modular design accepts a variety of bolt-on YHM accessories, available below. Smooth areas are drilled and tapped to accept Add-On Rails for additional accessory mounting options. Side and bottom rails have receptacles for Threaded Swivel Studs; RIFLE version also accepts YHM Forearm End Cap. YHM’s free-float attachment system eliminates accuracy-compromising pressure on the barrel, while anti-rotation screws prevent the forearm from working loose even during rigorous tactical operations. Large ventilation slots allow plenty of air circulation to dissipate heat and keep the barrel cool. 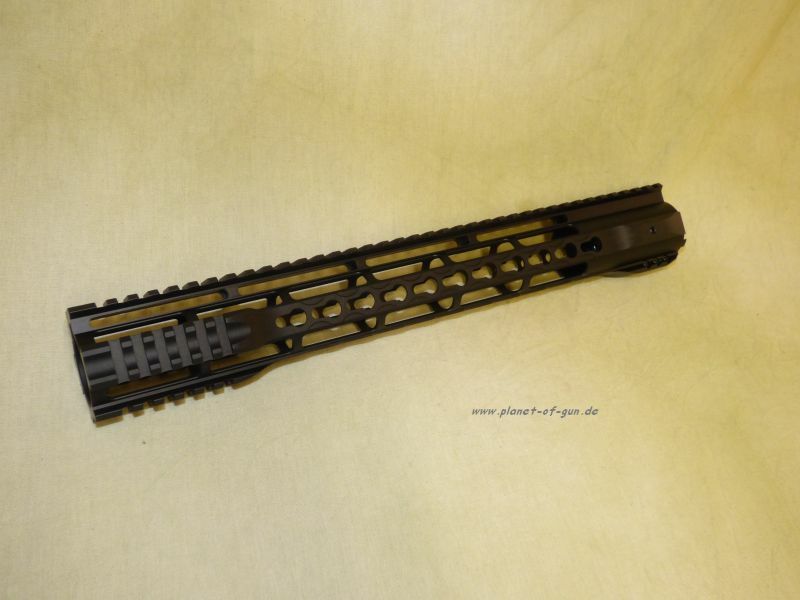 Carbine – Side and bottom rails extend around the front sight/gas block to get the accessories as far forward as possible and provide more grasping surface for the support hand. Cutout on top provides enough clearance to fold down a Yankee Hill flip-up front sight. Rifle – Extends to just behind gas block and includes a forward attachment point for Threaded Swivel Stud on the top rail. SPECS: Aluminum, mil-spec hardcoat anodized, matte black. Carbine – 9¼” (23.5cm) OAL, 2½” (6.4cm) diameter. 12.4 oz. (352g) weight. Fits AR-15/M16 with carbine-length gas system. Rifle – 12½” (31.8cm) OAL, 2½” diameter. 16.6 oz. (471g) weight. Fits AR-15/M16 with rifle-length gas system.